Sunglasses? Check! Fruity beverage? Check! You're all set for the afternoon. Little ones will love the pizza & cheeseburgers – grown-ups will love the happy hour. A mid-vacation visit to the spa for a hot stone massage, manicure or body wrap is a must. Your kids will love the activities, day camp, free movie and game rentals at the resort. 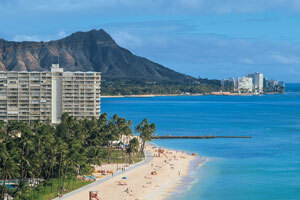 The Grand Islander by Hilton Grand Vacations is located within the Hilton Hawaiian Village Waikiki Beach Resort. Get your day off to the right start with breakfast at The Rainbow Lanai’s daily buffet. Once you get settled into your condo, have everyone change into swimsuits, apply sunscreen and get ready to hit the outdoor mini-pool. Lounge poolside with a book and work on your sun-kissed look while the kids race to see who the fastest swimmer is. When the little ones get hungry, Tropics Bar & Grill has you covered. The kid’s menu features pizza, cheeseburgers and fish & chips. For the grown-ups, there’s Grilled Mahi Mahi, Farmers Market Salad and Island Catch Fish Tacos. Stop by for nightly performances from local island musicians. The Grand Islander by Hilton Grand Vacations offers one- and two-bedroom condos that sleep four to six guests. Full kitchens have everything you need to make everyone’s favorites. Recruit the kids to help bake your famous chocolate-chip cookies – not that they’ll need convincing. There's no shortage of in-suite entertainment. Flatscreen TVs have premium cable so you don't have to worry about missing your favorite show or the big game. DVD players are perfect for family movie night. Gather the kids, pop some popcorn and get ready for a low-key night in. Now the only question is – Frozen or Tangled? Take advantage of the in-suite washer/dryer and do a load of laundry while the movie’s playing – that’s called multitasking. Challenge the kids to a video game tournament on the Playstation 3. DVDs and video game rentals are available at the resort or bring your favorites from home. If you want to be on a higher floor, book a luxury condo. Need more space? Upgrade to a two- or three-bedroom penthouse that sleeps up to eight guests. Guests of The Grand Islander by Hilton Grand Vacations have access to the amenities, pools and restaurants of The Hilton Hawaiian Village Waikiki Beach Resort. With five pools, plus a children’s pool for the little ones, there’s no end to the underwater fun. The Village is home to both Waikiki’s largest Super Pool and longest waterslide. Get ready to accept the World’s Best Mom award for your vacation planning skills. Kids aged five through twelve will have a blast at Camp Penguin. With arts and crafts, hula dancing and excursions that include visits to Honolulu Zoo, the Children’s Discovery Center and the Waikiki Aquarium, the kids will be so busy having fun they won’t even realize that they are learning. While the kids are at Camp Penguin, reward yourself for a vacation well-planned with a visit to Mandara Spa. Relax with a massage, body wrap or nail treatment. Dining options at the Village range from steak to pizza. Surprise the kids with a Blizzard at Dairy Queen and get your caffeine fix at Starbucks – there are two at the resort.